How many roads must a guinea pig walk down before you can call it a farm animal? Let me make one thing clear: I don’t eat guinea pigs. Eating a rodent is a little beyond the extent of even my relatively non-selective palate. I don’t judge the folks that enjoy cuy, it’s just a case of to-each-their-own. Souffle behind his house, with his former buddy hiding indoors after a particularly hearty bickering. Allow me to explain in a list, because I like making lists. 1)	Guinea pigs are essentially instant composters. You feed fruit and vegetable scraps in one end, and get fertilizer out the other end. No waiting for weeks for organic matter to break down, or for the worms to slowly eat their way through your garbage. You can pretty much watch it happen- it’s like magic. 2)	Guinea pig manure, like rabbit manure, doesn’t require aging. It can go directly into the garden. Better yet, used guinea pig bedding (which in our case is a bit of wood shavings covered with a lot of hay) makes fantastic mulch, with the fertilizer already worked in. You don’t have to pick through it, dilute it, or process it in any way. The bottom of the cage is upturned onto a suitable patch of earth, and that’s that. 3)	Guinea pigs cost practically nothing to keep. Hay is dirt cheap when bought by the bale, and makes up most of their diet. Vegetable and fruit scraps are exactly that- scraps. Wood shavings are also dirt cheap if bought by the horse-sized block, and you don’t need much anyway. 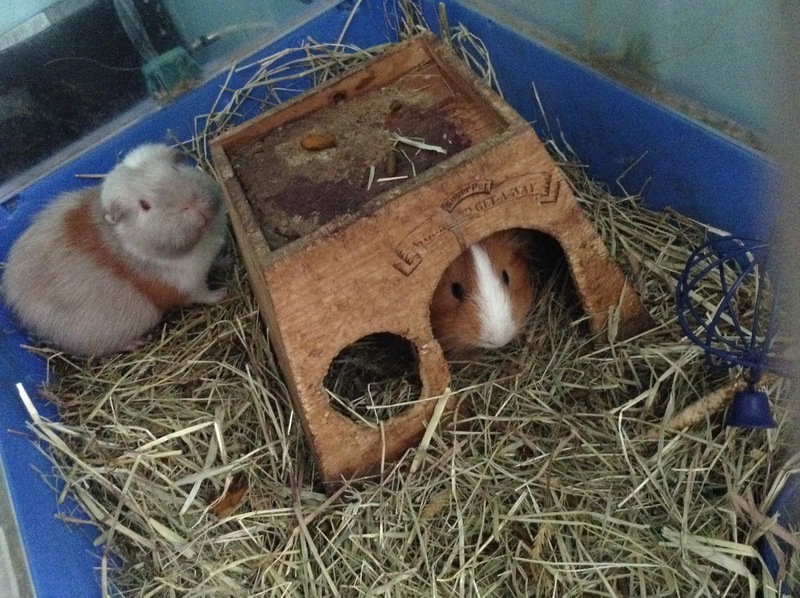 (They are too rough a substrate for the guinea pigs’ feet, hence why I cover the shavings with tons of hay. This provides food, bedding and entertainment all at once.) Pellets are no longer considered an essential part of a guinea pig’s diet by most veterinarians, though I still give them a little bit as a treat. Like a tablespoon per day per pig. This, likewise, won’t break the bank. 4)	Guinea pigs are wonderfully entertaining. They greet you with oinks when you enter the premises (mostly as a demand for food). They do the “hay dance” every time you give them a wad of fresh hay, rumbling and circling around the hay in unison. They chitter, purr, wiggle their butts (this is called “rumble-strutting” in guinea pig circles) in a hilarious way, and bicker like old couples. When they play, they popcorn (this is a motion that looks exactly the way it sounds). They have politics, for Heaven’s sake. You can watch the drama unfold every time there is the slightest suspicion as to who may be dominant over whom. It’s better than a soap opera. 5)	Guinea pigs are snuggly. They will actually sit on your lap and make contented guinea pig sounds for a good twenty minutes before they pee on you. 6)	The domestic cavy is a cheap and natural anti-depressant. It is the third-most ridiculous looking creature on Earth, ranking shortly behind the blue-footed boobie and the ezo momonga. (If you don’t know what I’m talking about, please pray to St.Google, the patron saint of the lazy and the ignorant.) You can’t stare one in the face and not laugh. 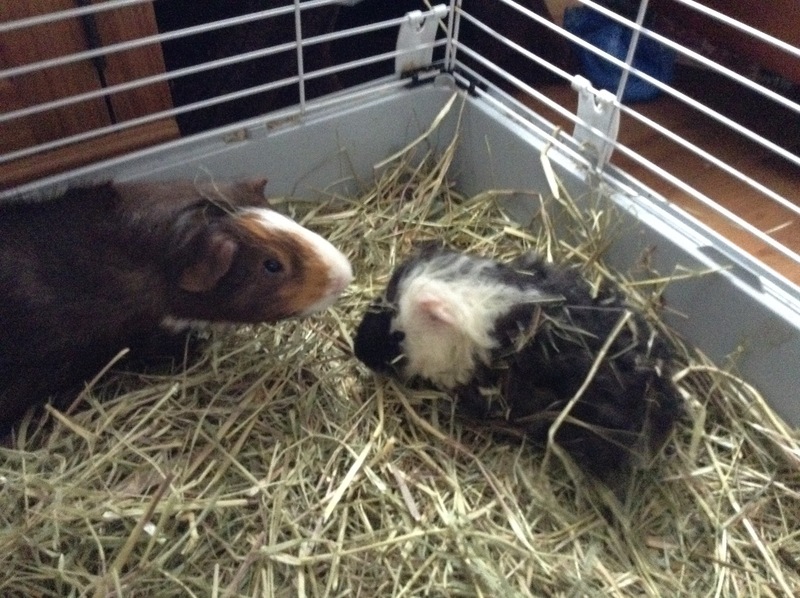 Current guinea pig population of Douchebaggery Ranch consists of Souffle, Mr.T and Pecorino. Souffle is the longest-standing member of DR, predating even the dogs and the cats. He is pushing 7, which is ancient by guinea pig standards. Mr.T is named as such due to his mohawk, which is magnificent enough to make it worthwhile to break the tradition of naming household pets after food. Pecorino is the latest addition to DR and the only purebred cavy (and also one of the few non-second-hand animals on the premises), being a Texel- he is a curly pig, and resembles a sheep crossed with a toilet brush. Mr.T reminding Pecorino who’s da boss.